Negative Non-Farm Payrolls have weakened American currency last Friday. The number of new paid employees was only 74 000 against the forecast of 196 000. This week the pair EUR/USD has continued to grow and can break through the resistance level of 1.3719 after US Retail Sales release. The indicator is probably going to drop from 0.7% to 0.2%. Regardless of the decrease of goods supplies, the drop of Retail Sales indicates the overstocking. From the other hand Eurozone's manufacturing index has increased by 1.6%, which will probably lead to the strengthening of the Euro. The pair is supported by the levels of 1.3548 and 1.3620. 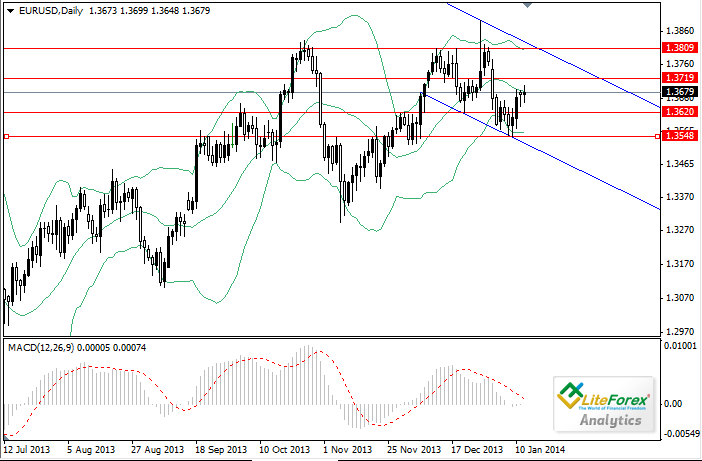 The closest resistance is local maximum 1.3719, which lies near middle MA of Bollinger Bands. It is recommended to open long positions at current price with Stop Loss orders at 1.3620. If the pair continues to grow, stop-loss can be moved to the break-even zone.